Note:Make salsa ahead if possible, as flavors develop nicely if allowed to set a few hours. Cube mango and cucumber into small cubes, place in bowl. Chop red pepper into small chunks, add to bowl. Finely chop jalapenos and add to mixture, as well as lime juice. Mix together, and allow to chill. Heat oil in large skillet. Pat fish filets dry with paper towels. Add to oil, and cook on one side until crispy and turns easily. Turn fish over and crisp on other side. At this point, fish should be cooked through, and you can break apart easily with a spatula into bite-sized pieces. Add lime juice and taco seasoning, and stir to coat. 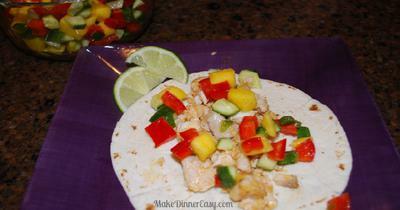 Fill taco shells with fish and top with mango salsa and desired additional toppings. Thanks so much to Jan from South Carolina for submitting this recipe. I made it for my family and it was a big hit (as pictured above) To make things easier for me I had the fish counter fellow at my local grocery store cube up the tilapia for me and I did seed the jalapenos to make it a bit more kid friendly. Super easy dish from fridge to table this took only about 15 minutes to make, including making the salsa! I used talapia and put a fish rub on it with a little lime juice. I put the filets on the grill and used the salsa. They were delicious. 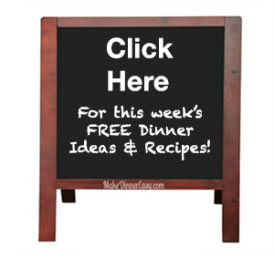 I was in the store parking lot checking emails and saw this recipe. I went right in and bought the ingredients to make it. They were delicious! I was in too much of a rush and cubed the fish before realizing that it was supposed to be cooked whole. It didn't get quite as crispy as fillets would have, but still tasted great. Can't wait to have the leftover salsa on chips. Fun, tropical feeling meal on a cold, rainy night. Thanks for sharing the recipe! These are fantastic fish tacos, and were a complete hit with my entire family! Even the kids!